Last year, Dizzee Rascal’s label XL Recordings shocked a lot of people when it announced that his new album, Maths + English, would not be available on a physical format in the U.S. Instead, the label made it available as a digital download, while giving it a full release in Europe. Although Maths + English drew strong reviews from dozens of U.S. publications, it didn’t enter the musical zeitgeist like another standout UK hip-hop release, M.I.A.’s Kala. Now Definitive Jux is stepping into the breach and giving Dizzee Rascal’s third album the U.S. rollout it deserves. On April 29, the indie rap stronghold will reissue Maths + English in CD format. It will also append two new tracks, “G.H.E.T.T.O.” and “Driving,” and a remix of Dizzee’s awesome “Where’s Da G’s” collabo with UGK by label boss El-P. With luck, Dizzee — a marvelous live performer — will make it over to the States for some gigs as well. The track listing for the revamped Maths + English is below. 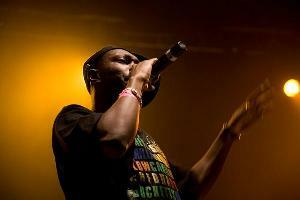 This entry was posted in News and tagged Definitive Jux, Dizzee Rascal. Bookmark the permalink.